The Society of Collision Repair Specialists on Monday announced a “riveting line-up” of panelists for its SEMA OEM Collision Repair Technology Summit — including the Texas attorney who shook up body shops nationally this summer with a $1 million lawsuit. But while Todd Tracy of Tracy Law Firm might be the most high-profile panelist at this point in the industry, collision repairers should also be intrigued and thrilled by the rest of the luminaries and issues planned for the annual Repairer Driven Education forums. While collision repairs can register for individual sessions ($75 if you register early enough), this year’s OEM Summit works as a trilogy. “The Summit topics will address the impact that automotive research has on vehicle construction and functionality, the impact that construction and functionality has on performing once-commonplace repair procedures, and the impact that those OEM procedures – or failure to implement them – have on liability and safety,” SCRS wrote in its news release. In a nutshell, Part 1 tells you what’s coming down the automotive pike so you can prepare your business or individual skill set. Part 2 examines how technological leaps like those in Part 1 change how you fix a car. Part 3 explains how and why you’ll get sued if your shop didn’t pay attention to the concepts mentioned in Parts 1 and 2. Sign up for all three here ($225), or buy the all-access series pass for $375, which gets one into any Repairer Driven Education class Oct. 30-Nov. 3, the entire OEM Summit, and the normally $75 SCRS Sky Villa afterparty Nov. 2. Session 1, “How Automotive Research is Driving Change in Vehicle Design, Technology and Function,” runs 9-10:30 a.m. Nov. 2. 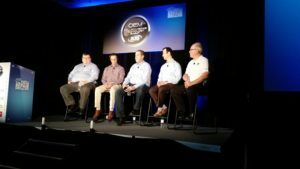 It will be moderated by SEMA vehicle technology Vice President John Waraniak, whom shops might remember from a 2015 OEM Summit session on scanning and whose own membership is likewise affected by OEM trends. Panelists include Ducker Worldwide Managing Principal M. Scott Ulnick, whose consulting firm is one of the definitive sources for future body materials trends; Mississippi State Center for Advanced Vehicular Systems Associate Director Matthew Doude, whose facility not only develops new vehicle technology but can study drivers as well; Kaiser Aluminum engineering Vice President Doug Richman, who taught shops about aluminum properties and repairs at the 2015 OEM Summit; and Dorn’s Body and Paint Vice President Barry Dorn, whose luxury-certified shop has to contend with the kind of technology the other three are studying and inventing. Panelists include Auto Care Association regulatory and government affairs Senior Vice President Aaron Lowe, who might have some interesting details to share about how regulators see the aftermarket with regard to ADAS or even autonomous vehicles; Honda collision assistant manager Scott Kaboos, whose OEM is sending thousands of new cars with ADAS on the road and into your shops and pledges freeway autonomy by 2020; and Dean McConnell, director of the Continental ADAS business unit, global customer programs, and NAFTA OEMs chassis & safety division, whose Tier 1 company invents much of the technology being incorporated by OEMs. Session 3, “The Hidden Dangers of Vehicle Technology, Improper Repair Methodology and Your Liabilities,” is “perhaps one of the most critical conversations collision repair facilities should be paying attention to,” SCRS noted. It runs from 3-5 p.m. Nov. 2 and will be moderated by Ellis & Associates Managing Director John Ellis, who has pointed out the difficulty shops face in knowing if a vehicle is truly electronically good to go. The concept of liability for failing to follow OEM procedures hit home for the collision repair industry when Tracy announced this summer his company was suing Dallas-based John Eagle Collision Center on behalf of Matthew and Marcia Seebachan, who were trapped in a burning 2010 Honda Fit. Experts for the plaintiffs said the severity of the crash and their injuries were the result of the body shop bonding the Fit’s roof during hail repairs for a prior owner. Honda OEM repair procedures dictate the roof of the unibody vehicle be welded. The Seebachans are seeking more than $1 million. And more collision repairers could be targets for similar disregard of OEM procedures, Tracy said. Rounding out the panel will be Audi collision programs Director Mark Allen, who has urged checking with an OEM before a repair, and Aaron Clark (Assured Performance), whose former shop Collision Solutions was the target of a lawsuit and who has a first-hand perspective of what a repairer would face. Space will be limited for all three events; early registration is encouraged. SCRS also acknowledged OEM Summit supporters AkzoNobel, BASF, CCC, Debeer Refinish, PPG, Reliable Automotive Equipment, SEMA and Toyota.